Seth Woods has established a reputation as a versatile man of many styles. While being classically trained, he has been seen in a variety of musical settings ranging from Baroque performance to avant-garde new music. Within the past few years, he has served as a principal cellist for the Henry Mancini Institute Orchestra, Rome Festival Orchestra, and Ash Lawn Opera Orchestra. He has also toured the U.S. and Canada with a rock band, Brighton, and has appeared in Canadian Music Festival in 2006. Seth began playing the cello in Houston, Texas. His private teachers include Daniel Morganstern, Frederick Zlotkin, Andre Emelianoff and has had master classes with The Eroica Trio, Stephen Geber, Quartet San Francisco, Bill Pruecil, Joseph Kalichstein, Christian McBride and Maria Schneider. Within the last year he has graced the stages of Carnegie Hall, Wang Theater, Union Nations, Merkin Hall and recently had his debut at the Jacob's Pillow Dance Festival with United Roots Dance Company. 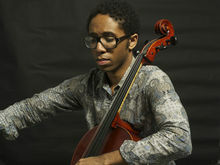 Mr. Woods is also the founding cellist of the award winning quartet VOX4. As an avid teacher and chamber coach, Mr. Woods worked in an outreach string program incorporating alternative styles for underserved schools in the Chicago area from 2005-07. His performances in 2009 will include premiering works by Joan Jeanrenaud and Christos Hatzis for solo cello and electronics in New York City, Boston, and London.